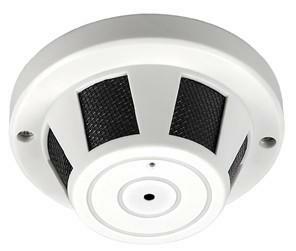 This Covert model neatly conceals a 600TVL High Resolution camera in a Commercial Style Smoke Detector Casing. Neatly concealed High Resolution camera with a wide 3.7mm Pinhole Lens in a Dummy Commercial Style Smoke Detector casing. Camera is mounted to point down from the side or may be repositioned to view from underneath if wanted.